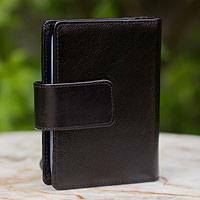 Java's Nell designs this sleek wallet for men in dark brown. 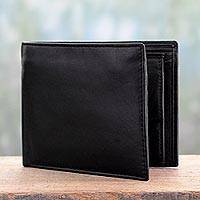 Crafted by hand of quality leather, the wallet features a bill compartment, six credit card slots, and two pockets. 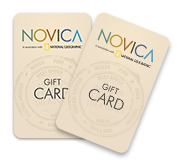 The distinguished allure of this wallet is rich in versatile elegance. 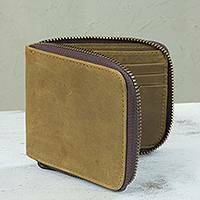 Designed by Nanan, the wallet is tooled of fine leather and features three compartments and a zipper pocket for coins. Indonesian designer Nanan transforms soft leather into an elegant wallet. Tooled by hand, the wallet features two compartments and a pocket with a button closure.